Love is not about property, diamonds and gifts. It is about sharing your very self with the world around you. hunting through the leaves of the night for your hands…. You can crush the flowers, but you can’t stop the spring. parked off somewhere else, asleep. come back? will you leave me here, dying?. Your wide eyes are the only light I know from extinguished constellations. And I, infinitesima­l being, drunk with the great starry void, likeness, image of mystery, I felt myself a pure part of the abyss, I wheeled with the stars, my heart broke loose on the wind. This time is difficult. Wait for me. 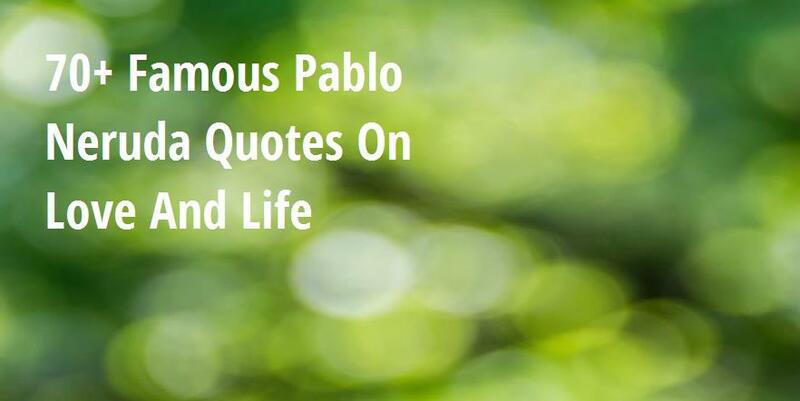 We will live it out vividly. Give me your small hand: we will rise and suffer, we will feel, we will rejoice. We are once more the pair who lived in bristling places, in harsh nests in the rock. This time is difficult. Wait for me with a basket, with a shovel, with your shoes and your clothes. Now we need each other, not only for the carnations’ sake, not only to look for honey — we need our hands to wash with, to make fire. Of everything I have seen, it’s you I want to go on seeing: of everything I’ve touched, it’s your flesh I want to go on touching. I love your orange laughter. I am moved by the sight of you sleeping. What am I to do, love, loved one? I don’t know how others love or how people loved in the past. I live, watching you, loving you. Being in love is my nature. I am no longer in love with her, that’s certain, but maybe I love her. 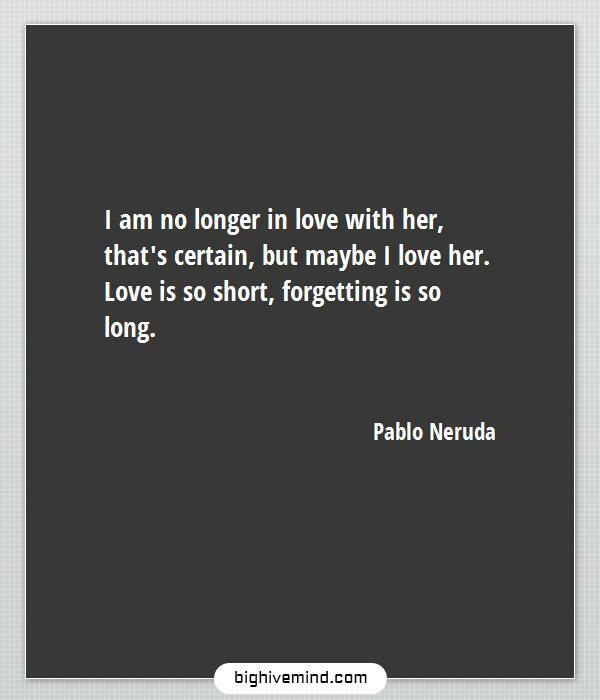 Love is so short, forgetting is so long. We are dust and to dust return. In the end we’re neither air, nor fire, nor water, just dirt, neither more nor less, just dirt, and maybe some yellow flowers. I will bring you flowers from the mountains, bluebells, dark hazels, and rustic baskets of kisses. I want to do with you what spring does with the cherry trees. Under your skin the moon is alive. In one kiss, you’ll know all I haven’t said. I have named you queen. There are taller than you, taller. There are purer than you, purer. There are lovelier than you, lovelier. But you are the queen. When you go through the streets No one recognizes you. No one sees your crystal crown, no one looks At the carpet of red gold That you tread as you pass, The nonexistent carpet. And when you appear All the rivers sound In my body, bells Shake the sky, And a hymn fills the world. Only you and I, Only you and I, my love, Listen to it. I love you between shadow and soul. I love you as the plant that hasn’t bloomed yet, and carries hidden within itself the light of flowers. 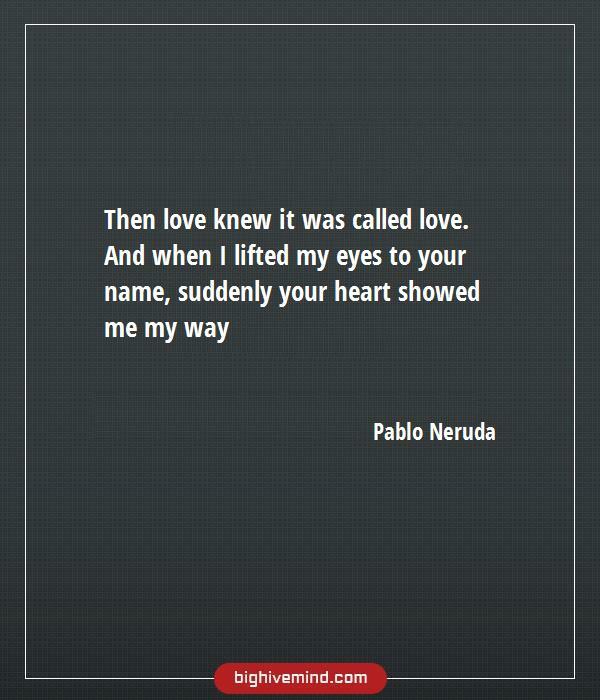 I love you without knowing how, or when, or from where. Because of you, the dense fragrance that rises from the earth lives in my body, rioting with hunger for the eternity of our victorious kisses. i shall go on living. i love you in this way because I don’t know any other way of loving. so I wait for you like a lonely house till you will see me again and live in me. 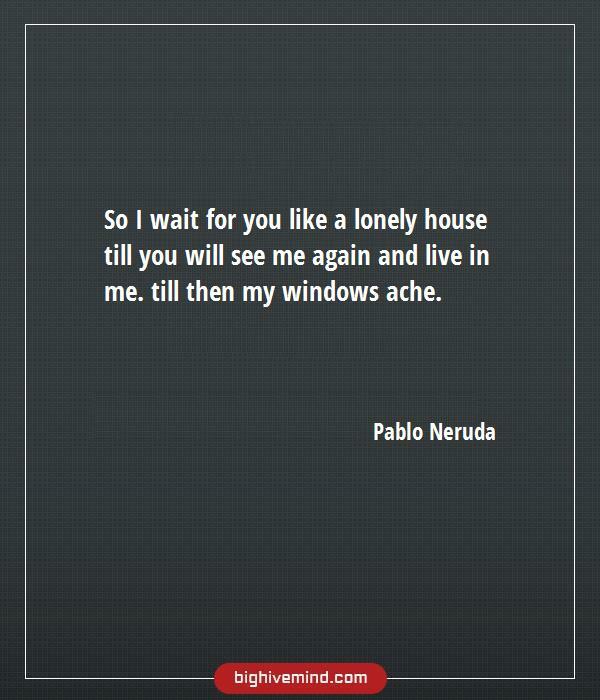 Till then my windows ache. How to speak to the sky. There is no insurmountable solitude. All paths lead to the same goal: to convey to others what we are. And we must pass through solitude and difficulty, isolation and silence in order to reach forth to the enchanted place where we can dance our clumsy dance and sing our sorrowful song – but in this dance or in this song there are fulfilled the most ancient rites of our conscience in the awareness of being human and of believing in a common destiny. till then my windows ache. and that’s why I go from life to life. Never an illness, nor the absence of grandeur, no, nothing is able to kill the best in us, that kindness, dear sir, we are afflicted with: beautiful is the flower of man, his conduct, and every door opens on the beautiful truth and never hides treacherous whispers. I always gained something from making myself better, better than I am, better than I was, that most subtle citation: to recover some lost petal of the sadness I inherited: to search once more for the light that sings inside of me, the unwavering light. You are like night, calmed, constellated. Your silence is star-like, as distant, as true.